Supporters of the proposed light-rail Purple Line will hold a kickoff rally Thursday evening to bring the community together to share their vision for the future Purple Line community. The State of Maryland, Montgomery County, Prince George's County and community organizations have formed an agreement to create a community compact intended to help Purple Line communities benefit from the line construction. The Fair Development Coalition, the organizers of the rally, intend for the agreement to help provide good jobs, afforable housing, and a vibrant local small business throughout the construction period. 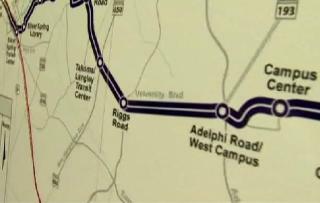 The Purple Line is a 16-mile project that would connect New Carrollton to Bethesda. Some residents fear that higher rent in communities along the line would push residents out of their community and that construction could hurt local businesses. Organizers hope to sign the agreement before January, according to the Washington Post. The rally will take place at 6:30 p.m. at St. Camillus Church, 1600 St. Camillus Drive in Silver Spring, Maryland.